Migraine headaches affect up to 15% of the population, affecting women approximately 18% and men 8%. It is deemed to be a significant disabler due to its impact on quality of life, especially when chronic. It is estimated that 1-2% of migraine sufferers are suffering from the chronic variant, i.e chronic migraine. Chronic migraine is defined as 15 or more migraine attacks per month for three months or more. Broadly, there has been consensus that migraines are caused by vascular dysregulation, contrarily to e.g tension headaches which are usually caused by muscular dysfunction. This was conclusion was especially easily drawn due to the fact that increase in heart rate and physical activity is virtually always the trigger of the migraines, and also because earlier drugs that caused vasodilation relieved the migraine. Later on, however, this consensus has been put to doubt, as seen in the above quote. Because reduced blood flow was still seen on the time of the attack, the vessel re-engorgement theory had to be put to rest. It is now thought that the vasodilation and vasoconstrition is a secondary effect, and that neuronal dysfunction, more specifically dysregulation of the trigeminal nerve pathway, is the primary trigger of the pathophysiology. The fact of the matter is, however, that despite massive research, the underlying cause of migraines are still considered to be unknown. There is no specific treatment thought to relieve the pathology with long term results. And drugs, although effective short term, can of course not be considered to address the cause, when they are in fact addressing the symptoms. Furthermore, the researchers have been much too quick to neglect vascular dysfunction after the main theory was disproven, in my opinion. Just because migraine is not shown to be a vessel re-engorgement side-effect, that doesn’t mean that it’s not triggered by vascular factors at all. It doesn’t warrant throwing vascular aspects away, only to consider neurological disorders, as there are several more vascular factors than vasal re-engorgement to consider and to be explored. For example, Norris et al., 1975 found retrogade (backwards) filling of the basilar artery post migraine attack. Retrogade filling of the cerebral arteries is a serious and concrete finding that, as far as I know, can not be reasonably explained by idiopathic neural dysfunction. It may, however, be explained by greatly restricted flow in the vertebral arteries, and this has also been associated with migraines in other papers. It can also, perhaps even more viably, be explained by craniovascular hypertension, due to compromised venous outlet. Several papers point out significantly reduced venous outflow through the internal jugular vein, and increased flow in the secondary vessels such as the vertebral veins. I’ll get into the specifics of why this is later on. Furthermore, several studies exist that point us to the the cause of the matter, and I will highlight some of these in this article. There are also studies that have found correlations between migraines and musculoskeletal problems, although no direct link was to found. Based on this, it is quite likely that there could be some kind of underlying muscularly related condition that is causing the vascular dysfunction. As mentioned, some researchers have claimed that migraines are caused by vasodilation, and regular headaches are caused by vasoconstriction. I do not necessarily agree with this, however. It could go both ways, and both would potentially trigger a migraine. I also strongly believe, and have found numerous times clinically, that most common headaches are of muscular origin. More on this in another article, though. The true underlying cause of migraines are of course widely controversial, but my own findings are that partial occlusion of the cerebrovascular supply (such as the vertebral artery) or venous outlet (such as the external and internal jugular veins) to or from the brain are the underlying cause of migraines. This means that there is either reduced blood flow into the brain, causing compensatory cerebral vasodilation (vessels distal to the partially occluded site will dilate; this is a well known compensatory occurrence post carotid stenosis, etc. (Pellerito & Polak 2012)) and vertebrobasilar insufficiency, or that the outlet is occluded, causing intracranial vessel hypertension and excessive, forced vasodilation. This ties in with the trigeminal sensory theories nicely, as the autonomical nerves innervating these vital cranial blood vessels will act as danger messengers and produce pain when the system is sensing that inadequate blood flow is coming from the inlet, or if vasal hypertension is occurring due to a blocked venous outlet. I thus believe that the trigeminal reactions are not at all a dysfunction, but warning signs. Considering the fact that migraine sufferers have a greater risk of stroke, this warning mechanism makes sense. This also explains why drugs that inhibit the serotonin receptors surrounding these vessels work great on resolving the migraine temporarily. In the genetically migraine-susceptible patient, activation of the trigeminovascular system can be initiated by a variety of triggers, including stress, certain foods or drugs, odors, trauma, and changes in sleep habits. I consider all of these to be secondary to the main dysfunction, partial vascular occlusion; restricted cerebral blood flow. As the trigeminal nerves sense compromisation of the cranial vessels, a chain reaction is initiated to stop the person from hurting themselves. Migraine, often with aura, occurs as a result. Not shockingly, the symptoms of vertebrobasilar insufficiency such as light and sound sensitivity, massive headaches, confusion and so on, are very seimilar to that of migraine attacks! Coincidence? I think not. 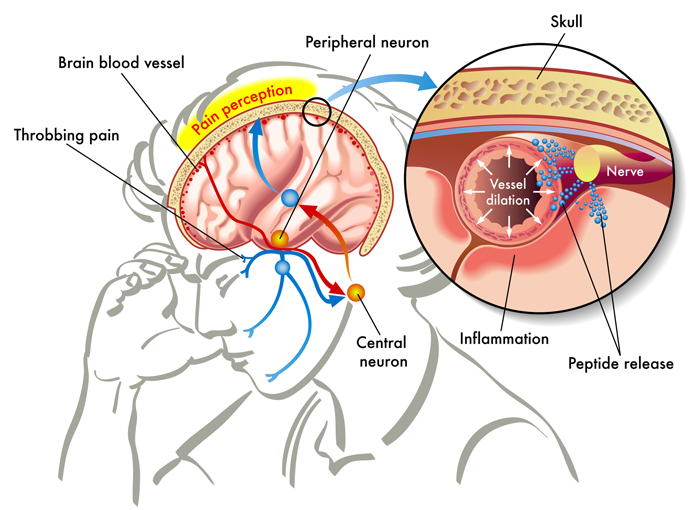 There has also been found an association also between migraines and hypertension (once again vetting against neural dysfunction as primary trigger, and for vascular factors as primary trigger, as they claim the vascular factors are secondary and not causative), and that increased compression onto the venous structures exacerbated the symptoms of migraine headaches. If valsalva does not cause venodilation in migraine patients, this indicates that the inlet may be occluded. The authors (Chund et al.,) speculated that the venous outlet was hardened and thus lacked expansive ability, but I do not believe this to be the case at all. Strongly believe, and have seen with many patients, that the intlet is occluded and thus the valsalva does not cause venodilation. I have also seen that the migraines can be triggered by increasing neck extension, as this will occlude the vertebral artery in TOS patients. Now, once again I think that some patients are having migraines due to occluded venous outlet and others due to an occluded arterial inlet, and the author does not specify which ones responded to what, but I think that they have listed all the relevant findings that they discovered, and that it doesn’t necessarily mean that the same patient who reacted to venous compression, also had reduced venodilation upon valsalva maneuver. The study below is another argument used to support the trigeminovascular theory, being that the vasodilation is a secondary effect caused by dysregulation of the trigeminal nerve’s pathways. However, why would venodilation be restricted upon valsalva if the arteries were properly dilating and has adequate blood current? It would not (unless indeed sclerotic, but I do not believe this to be realistic). This can not reasonably occur unless the inlet, the arterial inlet, is somehow occluded, or if an intracranial vessel is occluded. In line with this, Olesen et al., 1990 (cited in Gooriah’s article that I quoted initially) specifically found that blood flow was reduced and not increased during the attack. This is also conflicting with any notion that the vasal dilation is a secondary effect, but rather indicates that reduced arterial inlet is causing the migraines. In accordance with this, more studies indicate that both occluded venous outlet as well as occluded arterial inlet may cause migraines (Chahwala, 2017; Sell, 1994; Saxton, 1999), and some of these studies with surgical intervention have shown immediate resolution of all symptoms post successful procedure. I strongly believe that these essential vascular occlusive regions are not being considered when researching migraine headaches, because I have seen that resolving them will resolve most patients’ migraine problems permanently. That said, let us look closer on the above-mentioned common areas of vascular occlusion. So far, I have not seen a single patient suffering from migraines who did not also hinge at the cervical spine. Hinging at the neck implies that one or more cervical levels are collapsing, causing one vertebrae to flex and one to hyperextend. This may not only cause disc injuries down the road, but it will immediately compromise vascular flow, as the hinging vertebrae will cause occlusion of the vertebral artery and vertebral vein within the transverse foramen of the vertebrae. I do not know of any studies that confirm this, but try for yourself to hinge at the neck by letting the cervical spine collapse so that the head falls backward; it won’t take many seconds before you start feeling intracranial pressure build-up. Additionally, hinging at the neck will cause lack of tensegrity due to lack of stability. The muscles that attach to the cervical spinous processes as well as to the cranium requires a stable holding points in order for the nervous system to utilize these structures properly (or else it would be like pulling on a loose handle). Because of this, cervical hinging not only causes disc damage and [partial] vascular occlusion, but massive regional muscular inhibition and dysfunction. Hinging also inhibits normal axial cervical rotation, extension, and general articulation. In practice this means that because the neck can not normally move as ‘one’ unit, due to fixation at the hinging level as well as dysfunction of the surrounding muscles, excessive movement will be forced to occur at the upper and middle cervical levels. This is a common contributor to ligamentous laxity, especially at the atlas joint levels. Ligamentous laxity combined with muscular dysfunction is a bad combination, often leading to gradually increasing misalignment within these joints, which once again exacerbates muscular dysfunction further, as well as potentially pulling on and damaging the vertebral artery, and occluding the internal jugular vein. More on this shortly. The hinge may occur at the upper, mid or lower cervical. To identify it, run your fingers down the spinous processes of the cervical spine and feel for an indent; a divot. Instructional video can be watched below. A result of long-standing hinging at the lower cervical, is the Dowager’s hump aka buffalo hump. This is curable if the patient learns to get out of the hinge, by pulling the back of the head up toward the roof and gently depressing the chin to activate the deep neck flexors such as the longus colli and longus capitis. Once again, I have not seen a single patient with migraine who did not have the cervical hinged posture. It seems to be the root of a series of unfortunate bodily occurrences, and is of massive importance to identify and treat immediately after it has been identified. Treating the hinge (i.e removing it) and re-establishing proper cervical movement patterns should be the initial and primary measure when treating migraine patients, in my experience. Secondarily, the atlas and thoracic outlet will be addressed. The suboccpitals attach between the skull and down to unto C1 as well as C2, and will help to syncronize the upper cervical with the skull’s movement, and prevent misalignment of the atlas joints due to its pulling angles. In other words, absolutely essential functions. They are also, when significantly weak, a common cause of vertigo as well as migraine-mimicking headaches such as cluster headaches in the eye. In patients with migraines and hinge-necks, these muscles are almost always dysfunctional. Additionally, the suboccipitals syncronize the cranium’s movement with the eyes’ movement. If you palpate your suboccipitals while moving the eyes around, you’ll feel them fire up according to the ocular movement. The suboccipitals are often blamed for many things, but are almost always weak in the very same patient group. I never recommend to stretch or massage these unique muscles. Furthermore, as I said, when the neck is hinging, which it usually is, the suboccipitals will inhibit. The suboccipitals extend the skull upon a stable cervical spine. If the neck is hinging, stability is lost, and occipital extension is compromised. Watch my video on how to correct this below. Clients with this dysfunction will need a lot of practice as well as obvious postural and strengthening work, in order to reverse the dysfunction and re-engage the suboccipitals. And as I also touched upon above, severe suboccipital weakness, which is common in migraine victims, may cause brutal headaches, often in and around the eye. Although this is ‘just’ muscular pain, it may resemble migraine headaches due to its intensity. To identify it, squeeze hard into a sore spot of the client’s suboccipitals. Hold the squeeze for at least 10 seconds. If it reproduces significant headache or pain in some form or shape, it needs strengthening. NOT myofascial release, but strengthening. In patients who have a history of neck trauma or are suspected for atlas dysfunction/misalignment, compression of the internal jugular vein may be present. The internal jugular vein passes just anterior to the transverse process of the atlas vertebrae, and thus the C1’s transverse process doesn’t need to come very far forward in order to partially occlude it, partially blocking the cerebrovascular outlet. If a patient has atlanto-occipital laxity, which is a somewhat taboo term but is surely reality for many patients, the atlas (C1) and axis (C2) may torsion between each other or in relation to the occiput. Atlantooccipital torsion (torsion between the cranium and C1) will cause the transverse process on one side to come forward, compressing the internal jugular vein along with the nervous structures coming out from the jugular foramen, such as the vagus nerve and the accessory nerve. With potential, due to its proximity, the internal carotid artery could also be partially occluded if there is severe atlanto-occipital torsion. I’ve seen some ultrasound scans showing 100% increase of venous current in the IJV after getting the atlas corrected, according to certain atlas correction pages. I do not agree with their corrective protocol which is why I won’t mention names, but I am planning to do my own doppler scans before and after on similar patients in a year or two. I’ll keep you posted. The point is that atlas misalignment can block the venous flow coming from the brain, and therefore contribute to migraines by causing hypertension and thus also hyperdilation of the intracranial vessels. Furthermore, when the atlas twists on the occiput and/or on the C2, this will pull on the vertebral artery and may thus cause insufficiency as well. Therefore C1 laxity may compromise both the vertebral artery (due to increased distance between the transverse foramen of C1 and C2) as well as the internal jugular vein (due to forward translation of the C1’s transverse process). Evidence proving that vertebral artery occlusion is associated with migraines will be quoted in the scalene and thoracic outlet sub heading. The subject of assessing and correcting the atlas joints is one too great to expand upon in this article, but you can read more about it in my atlas joint article (link). It is however necessary to understand that most protocol do not properly measure torsions between the atlantoaxial and especially not the atlanto-occipital joints. I’ll briefly talk about the measurements that must be done in order to get a genuine structural status. The atlantoaxial joint can be measured directly with an MRI or CT scan. It can also be estimated with palpatory techniques, by first measuring the A-O joint, then comparing its alignment to the alignment of the axiocervical joint. To properly measure the A-O joint, compare the position between the mastoid process of the skull and the transverse process of the atlas vertebrae. The C1 transverse process should bilaterally be situated directly beneath the mastoid process. Some osseous anomalies may occur, but not to significant extent. If the transverse process is too far forward, this may compress the internal jugular vein and pull on the vertebral artery, both contributing to migraines. When palpating the transverse process, make sure that it is not the styloid process of the skull that you are measuring. If there is significant torsion, it may be difficult to distinguish between the styloid process of the skull and the transverse process of the C1. More about this in my atlas article. Once the rotation of the atlas has been measured and estimated, axiocervical rotation must be measured as well. This is easier then measuring the A-O, as we simple measure alignment of the spinous processes of the C2-C4. They should be relatively straight and nicely lined up. If there is axial misalignment, it will be rotated to one side. Atlantoaxial rotation is not easily measured directly, because the posterior tubercle of the atlas vertebrae is not a reliable landmark of palpation. Therefore we measure the A-O and A-C (axiocervical – C2-4) separately, and thereafter estimate atlantoaxial rotation based on these two measurements. If the C1 transverse processes is beneath the mastoid process bilaterally, and the C2-4 spinous processes are nicely lined up; the atlas joints are symmetrical. Sometimes the axis and atlas has rotated the same way, other times they are torsioned. If you find that the right C1 transverse process is forward (rotated towards the left), but the spinous process of the C2 is left in comparison with C3-4, this indicates torsion between the A-A joints and may be a warning sign for increased risk of vertebral artery injury as well as occlusion. I won’t address correctives for atlantal torsion in this article, but a good start is to get out of cervical hinging, optimize scapular resting position, and strengthen the suboccipitals as well as the longus colli and longus capitis muscles. The subclavian artery may be compressed and thus occluded between the anterior and middle scalene muscles, as well as between the clavicle and 1st rib (in the costoclavicular passage/space). The subclavian artery is technically the artery that supplies the arm, but as many of you may know, it branches out as the vertebral artery (which once again supplies the brain) slightly proximal to the area of potential occlusion. Excessive tightness of the scalenes due to long-standing weakness is almost always the cause of the occlusion. The brachial plexus passes through these muscles as well, and when they are dysfunctional, both vascular and neurogenic symptoms may occur. This is also known as ‘thoracic outlet syndrome’. Furthermore, a posturally dropped clavicle, which is very common, will reduce the space in the costoclavicular passage (Read my TOS article that I linked earlier to learn more about this), compressing the subclavian artery and thus potentially contributing to and exacerbating any preexisting vascular occlusion, such as within the scalenes. Research has shown that occlusion of the subclavian artery also will restrict blood flow within the vertebral artery, which is why thoracic outlet syndrome also may be accompanied by migraines, dizziness, light sensitivity and similar symptoms that may resemble both migraines and vertebrobasilar insufficiency. This last common denominator is another quite clear indication that the mechanism of migraines are indeed of vascular origin and not an idiopathic neurological dysfunction of the trigeminal nerve’s vascular sensory system, as I touched upon earlier. Occlusion and/or injury of the vertebral artery may also cause thunderclap headaches. Thoracic outlet syndrome is curable, but not by the means of stretching, massaging or needling. Specific strengthening exercises for the scalenes along with postural correctives is what needs to be done. It requires attention to detail as well as patience, however, and a decent pain tolerance. Although strengthening the scalenes (as well as getting out of the «hinge neck» and raising the clavicle in posture) is the cure for TOS, this will have to be done very mildly in the beginning. I have seen as little as 10 repetitions of the anterior scalene exercise cause wild migraines, dizziness and even fainting in a few clients. Severe cases may have to do as little as 2-5 repetitions per day for the first weeks, gradually increasing the work intensity as the scalenes are slowly coming back to health. Their work capacity is so low than even the slightest loading will cause inflammation and exacerbation of all of the symptoms, be it neurogenic or vascular. For more information on this topic, it is once again too great to expand upon in this article, please read my thoracic outlet syndrome article. The external jugular vein may also commonly become occluded. The external jugular vein’s course is between the clavicular portion of the sternocleidomastoid muscle and the anterior scalene. If these muslces are very weak, they become excessively tight and compress the vein to such extent that blood flow capability may be compromised. Distension will then occur and the vein will be seen popping out on the lateral neck. Now, I do not really think that mild occlusion of the EJV alone is a significant problem; a much more serious problem is if the internal jugular vein is occluded, as with significant atlas torsions as mentioned above. I see a lot of patients with distended EJVs who do not have any symptoms. However, it may act as a «last drop» kind of ordeal and thus I prefer to briefly discuss it rather than disregard it. Though a slight digression, another interesting thing to have in mind, is that the vagus and phrenic nerves may also entrap between the scalene and SCM, just like the external jugular vein. So if the EJV is popping out, there may also be vagal or phrenic dysfunctional symptoms along with it, such as tinnitus, lump in the throat, clogged ears, hiccup, or even dysregulated heart rate. Neck injured clients often present with one or more of these symptoms. When occluded, the vein will distend as shown below. It can be resolved by strengthening the clavicular portion of the sternocleidomastoid, as well as the anterior scalene muscle. Occlusion of the internal jugular vein may also cause distention of the EJV, however, as the blood flow is rerouted through it. In such case, the EJV may or may not be occluded itself, it will distend due to increased blood flow. If distention is resolved after atlantal correction, then the EJV itself was probably not occluded, but just affected by the reroute and increased blood flow. I’ve seen this a couple of times, being IJV occlusion, and it usually presents as significant distention of both the EJV and anterior jugular vein, where as ‘common’ EJV distention will present with only the EJV and not the anterior jugular vein distending. If your patient’s veins are popping out when the neck is extended like it does in the picture below, then the atlas may need to be assessed. This is a rough rule though, and by no means a blueprint. Treat what you find. Although the jaw has no significant direct relation to intracranial blood flow in terms of vasal occlusion, it does have massive impact on the trigeminal nerve. Well, to be fair, these nerves do to some extent dilate and constrict intracranial vessels if signaled to do so, but I do not believe that this is the common migraines’ culprit, as I see so many patients without TMD nor trigeminal dysfunction who still have migraines. Branches of the trigeminal nerve, more specifically the auriculotemporal nerve, may be directly compressed between the mandibular condyle and the skull in patients who have TMD. Furthermore, other branches, such as the buccal and lingual nerves, may entrap within the lateral pterygoid muscles. This is why patients with TMD often also have symptoms of facial numbness, tinnitus and the likes. Trigeminal neuralgia can also cause massive lightning-like headaches shearing into the temple area of the skull, and this may be mistaken for real migraines. These will not be triggered by increased heart rate, however, but e.g by chewing hard foods, or teeth clenching, which is atypical for migraines. As we know already, the trigeminal nerve is definitely involved in pain signaling in relation to migraines, although I believe (as you know by now) that these are fundamentally caused by restricted blood flow. True migraine headaches thus can both be amplified by trigeminal irritation, as well as be mimicked by trigeminal neuralgia. I’ll quote Gooriah’s paper again, as mentioned initially in this article. So, once more, to clarify. Trigeminal nerve entrapment may amplify any predisposition caused by vascular occlusion. But, trigeminal neuralgia may also mimic migraines headaches without truly being one, i.e without there being a present vascular occlusion at all. There are also some relationships between posture and the TMJ, which is why addressing it – if it (the jaw) is in fact a problem – may be worthwhile. I can not expand upon this topic completely in this article, so go ahead and read my temporomandibular dysfunction article if you think your patient’s jaw is a problem. Briefly, the approach is that the mandible must come forward in posture, and the lateral ptergyoids will require significant strengthening. Much evidence as well as anecdotal evidence and clinical experience points to occlusion of the vascular in- and outlets as the most common cause of migraines. There are claims that the vascular trigger of migraines have been debunked, but this is far from the truth; only one vascular theory have been disproven. More so, the modern research do still not have any solution that offers long term relief to migraine sufferers. The theories of idiopathic dysregulation of either vascular or neurological pathways, no matter how fancy or complex it may sound, have nothing else to offer than drugs with temporary relief with regards to treatment measures. Personally I have found that vascular occlusion caused by forward head posture (especially cervical «hinging»), atlas misalignment and thoracic outlet syndrome are all common causes of migraine headaches. In fact, I have never seen a single migraine patient who didn’t fit at least two of these criteria. These are specific findings with specific treatment protocols, and may thus be treated conservatively with good and lasting results, contrary to idiopathic neurological disorders. Vascular occlusion is treatable, and the prognosis is positive. The work however is tough, and the means of therapy are widely multifactorial. Especially the thoracic outlet and atlas joints have a significant impact on migraine development, as they may occlude both the subclavian artery, vertebral artery, vertebral vein, internal jugular vein and external jugular vein. Furthermore, faulty posture is often the underlying common denominator for the series of dysfunction, as it may promote serious muscular dysfunction, atlas misalignment and laxity, as well as costoclavicular compression. All in all, by getting the patient out from cervical hyperextension («hinging»), raising the clavicle in posture, i.e off the clavicle, and strengthening the scalenes, a lot of good work has been done. Furthermore, the atlas joints may require corrections, as may the temporomandibular joints. This article was incredibly valuable in helping pinpoint my husband’s migraine causes. He has a Dowager’s hump, and the migraine symptoms you pinpoint in the above diagram (except for the pupil one), but also incredible thirst. Do you know of any correlation with thirst in regards to vascular deregulation and migraines? Might be reaching here. He has seen an endocrinologist and had a blood panel. Thank you for your articles, I think they are very well written and referenced. I hope you don’t mind if I make a quick question. Do you think there may be a link between migraines and ptosis and numbness of the face? In my case, this symptoms are always present (only on the left side), but I’ve noticed they intensify when I suffer a migraine, that’s why I’m asking. If so, would this be because of irritation of the facial nerve or the trigeminal nerve? I’m a bit confused. The level of detail in your articles is incredibly helpful. They confirm my theory that my migraines and tinnitus are related; and both caused by neck issues. I haven’t found such direct validation from anyone else before (online or from various ENT’s, MT’s, PT’s, etc). Thank you! Why is “anto-occipital laxity” considered taboo? I have been suffering for over 7 years and when I asked a specialist 6 years ago if I could possibly have atlas misalignment he said no and I have been unwell since and still struggling to find help/answers to why I have pain in my head and at times vomiting. Who can diagnose this and how?